Award-winning hot tub and swim spa specialist The Pool and Spa Company has announced a restructure of the company and changes for senior members of the family-run business to achieve enhanced sales and customer service. While the company has been landing a long list of honours, including Hydropool’s Platinum Award for Excellence in Customer Services Sales and Marketing, 30-year-old Christina, pictured second right, has become well known throughout the industry as part of trade news coverage for the company in Hot Tub Retailer magazine and also as a regular visitor to the UK Pool & Spa Expo and SPATEX exhibitions. Christina, who married Charles Clarke on Valentine’s Day two years ago at the Vrede en Lust Wine Estate and Vineyard in the CapeWinelands, Franschhoek, South Africa, is now taking over all aspects of retailing as Managing Director to spearhead future success as part of the restructure. In the meantime, Theo is now going to be focusing entirely on the construction side of the family business. As part of the changes, The Pool and Spa Company title has been replaced with a new business structure under the name of The Hot Tub and Swim Spa Company. Staff numbers have also been boosted to increase customer care, sales, and showroom provision, while a new website address www.hottub-swimspa.com has been launched. “As well as my new title, we have now instigated some very exciting changes,” said Christina. 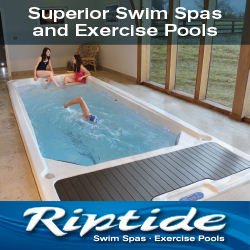 The wet leisure specialist dealership has also been boosted by the fact that Hydropool has received WhatSpa? and WhatSwimSpa? Best Buy Award honours for the 700 Platinum and AquaTrainer 19 DTFX to add to previous accolades in the respective hot tub and swim spa consumer magazines. The seven-seater H700 Platinum, with a water capacity of l,720 litres and coming in at 236 x 236 x 99cm, has 50 hydrotherapy jets and has been highlighted in the WhatSpa? Best Buy Verdict in the £12,000+ price category for its unique ‘self cleaning’ features and the fact that its spacious design incorporates dual side-by-side loungers. Coming in at 5.74 x 2.36 x 1.35m, the AquaTrainer 19 DTFX is one of the largest in the range and with a water capacity of 7,862 litres the design includes two patented AquaFlow wide swim jets for a strong, uniform and easily controlled current. It is proclaimed in the WhatSwimSpa? Best Buy Verdict in the £22,500+ category as being a ‘fab, high-quality dual chamber option at the premium end of the market’, while also highlighting that the ‘percentage flow control system’ provides fine graduations of flow to be able to be achieved to suit different swimming requirements. Meanwhile Hydropool, which attended the first two UK Pool & Spa Expo events as an exhibitor, has taken advantage of the opportunity of an additional outing at the NEC this year by announcing it will be exhibiting during the fourth edition in November. Bookings for exhibition stand space at the fourth edition of the UK Pool & Spa Expo at the Birmingham NEC in November are currently being taken by the New Events team. For details email: info@ukpoolspa-expo.co.uk or contact the New Events team directly on +44 (0) 1483 420 229.